With winter finally loosening its grip and warm spring temperatures in the forecast, you need to think about where all the water from those melting snow piles is going to go. If you follow the steps listed below, it won't be heading into your basement. The waterproofing experts at Royal Work Corp. are knowledgeable about common basement concerns, can assist you in finding potential problem areas and recommend corrective action now to avoid flooding later. An expert technician will review the current condition of the exterior and interior basement waterproofing at your home and will provide honest advice on any needed repairs. Protect your family and valuable possessions from hazardous mold and damaging flood waters this spring by scheduling an appointment today. 1. Interior foundation wall cracks. You may notice small cracks on the foundation walls. You may notice them over time as the ground settles, and they may expand further with winter freezing and thawing. Hydrostatic pressure caused by groundwater may also lead to foundation weakening and create gaps or cracks. Regardless of size, any cracks with visible water leaking through or moisture discoloration should be checked out quickly by a professional. All cracks present a safety risk and can allow water infiltration. 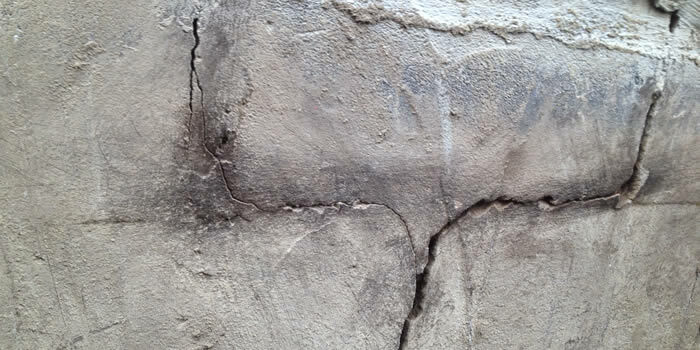 Injection of polyurethane into expanding cracks is the preferred method for repairing interior wall fractures. After cleaning the area to remove loose particles, plastic injection tubes are inserted, polyurethane is injected and a fast-curing epoxy covers the entire area. This provides a tight, yet flexible seal that is resistant to further cracking. Other interior waterproofing methods include concrete coatings, sealers, paints and panels. Coatings are thick, adhere to concrete and masonry walls and dry to a cement-like finish. Sealers are meant for unfinished concrete surfaces and bond through a chemical reaction for optimum waterproofing. Concrete paints, like typical paint products, come in a variety of colors and can be used over previously painted surfaces. Panels will cover stained walls but other interior waterproofing methods should be implemented prior to installation. 2. Floor cracks or cove joint seepage. 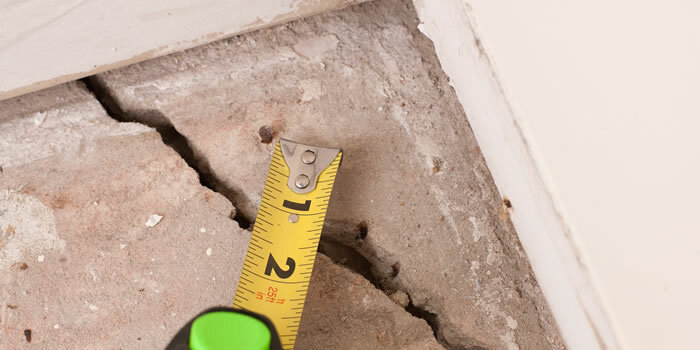 Unlike wall cracks that can be repaired with no further water infiltration, floor cracks may indicate a serious problem. Soil erosion underneath or around the perimeter of your foundation can compromise the structure and will require immediate attention. A Royal Work specialist can provide a thorough evaluation to confirm if this is the case and the extent of the problem. A small space between the floor and the foundation, called the cove joint, allows pressurized water to seep from the soil outside your home, through a keyway and into your basement. An interior drain tile system is the recommended process for dealing with floor leaks caused by hydrostatic pressure. A channel is chiseled through the concrete floor around the perimeter of the basement. A PVC pipe and membrane are installed and connected to a sump pump, the most powerful defense in basement waterproofing process. Porous gravel covers the pipe and the concrete floor is replaced. Any water that permeates the walls or floor is pumped out safely. Plastic sheathing is often used in conjunction with floor drainage systems to manage water infiltration. Used as a water barrier, any moisture runs down the back of the panel and is captured by the floor drainage system. The sump pump will re-direct any water out of the home and discharge to a safer place. The most powerful defense in basement waterproofing is a properly working sump pump. If one is installed in your home, listen as water drains into the pit. If there's a lot of runoff, the pump should be emptying regularly. If the ground is still frozen and water is not running freely yet, you can be sure it's working properly by pouring a pail of water into it. It should activate fairly quickly and pump the water through the pipe and safely re-direct it outside the basement. A sump pump battery backup system is worth the expense and recommended if your pump is more than five years old. If your home doesn't have a sump pump or you need to replace an old one, installation services are available through Royal Work Corp. Each technician is licensed and bonded for your peace of mind. Your risk of flooding can be reduced significantly and a current promotion will save you $100 on sump pump and backwater valve installation. 4. Windows and window well drains. If you notice a dark spot on the concrete wall or water dripping from the top of the wall after rainstorms or a thaw, your basement windows may be the problem. A leaky window may seem to be a minor problem, but it can cause damage and excess moisture that leads to mold growth. In addition, clogged window well drains can fill up with water and flood the basement. Polyurethane caulking can be used to fill small cracks around windows and hydraulic cement is used for larger ones. Hydraulic cement will require a hand-held grinder to open up gaps but will expand to create a tight fit when exposed to water. Older windows and frames may need to be replaced due to damage or rotting. If window wells have been installed to compensate for below-grade windows, it's important to make sure they are free from debris such as leaves and branches. These can be catch-all areas where water will pool and can overflow if the drain becomes clogged. To check that the drain is operating properly, run water inside the well and watch for pooling. Clear plastic covers can keep the wells debris-free while still allowing light to penetrate the dark basement area. After a long winter with blowing and drifting snow, your roof and gutters have taken a beating. With the onset of spring, the heavy snow built up on your roof will begin to melt and drain down to your home's gutters. Often dirt, leaves and branches will be deposited along the gutter line which can cause the runoff to overflow and drop straight down along your foundation. Window wells can also fill with water, cause your windows to leak and make a big mess. Prevention goes a long way when it comes to your gutters. Make sure to clean them out as soon as the ice melts. Also make sure downspouts are draining away from windows. They should drain at least four feet from the foundation walls. If not, add extensions. An often overlooked problem in maintaining exterior waterproofing relates to how the soil is graded next to the house. As you probably know, runoff will follow a path away from the house if the soil is inclined properly. Even though it may have started out that way, many times the slope will change from overflowing gutters, ground settling or flowerbed creation. A minimum grade must be maintained away from the foundation in order to decrease water seepage. Your Royal Work contractor can make the necessary adjustments to obtain the optimum grading. Now that the long, cold winter is finally over, you'll want to get outside and enjoy spring activities with friends and family. 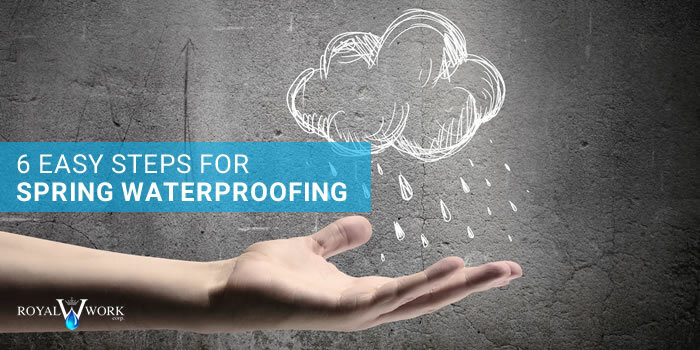 By spending a little time inspecting your home for common waterproofing problems now, you can potentially save yourself thousands of dollars later. Remember to check your basement walls for interior cracks and gaps, your floor for cracks or cove joint seepage, your sump pump for proper operation, your windows for leaks and window wells for clear drains, your gutters and downspouts are debris-free and drain four feet from the house, and the yard is sloped away from the foundation. Interior and exterior basement waterproofing - services include excavation, foundation repair, membrane installation, sealants, French drain installation and slope correction. Sump pump installation - services include new and replacement pumps, crock excavation, French drain connection and backwater valve installation. Interior and exterior concrete work - services include sidewalks, stairs, porches, basement floors and underpinning. Drain cleaning - services include washroom and kitchen drains, toilets, sewer line, main drain and storm drain with specialized equipment such as drain snakes, high pressure water jets and video cameras. Join the many satisfied customers in working with the best. With over 25 years of collective service, you can trust the team at Royal Work to provide high-quality workmanship that will last. You can save up to $500 now on your waterproofing project, and senior clients are eligible for a 10 percent discount. Royal Work has four convenient locations in Brampton, Oakville, Mississauga and Toronto to handle all your waterproofing needs. With experienced technicians, competitive pricing and a 100-percent satisfaction guarantee, you can trust the job will be done right. As a premier service provider in the Toronto and GTA, all waterproofing jobs receive a 25-year warranty. Call for more information or to schedule an on-site, no-obligation estimate. You'll be glad you did.